In an old post, dated 2011, I explained various types of VPN technologies. In seven years several things have changed: SHA1 is deprecated, des and 3des are no more used for security issues, but some VPN technologies are still used with protocols more secure (SHA256, AES, …). In this article, I explain how DMVPN works and what are the key components of it. Multipoint GRE (mGRE) tunnel interface: allows a single GRE interface to support multiple IPsec tunnels, simplifying the size and complexity of the configuration. Dynamic discovery of IPsec tunnel endpoints and crypto profiles: eliminates the need to configure static crypto maps defining every pair of IPsec peers, further simplifying the configuration. 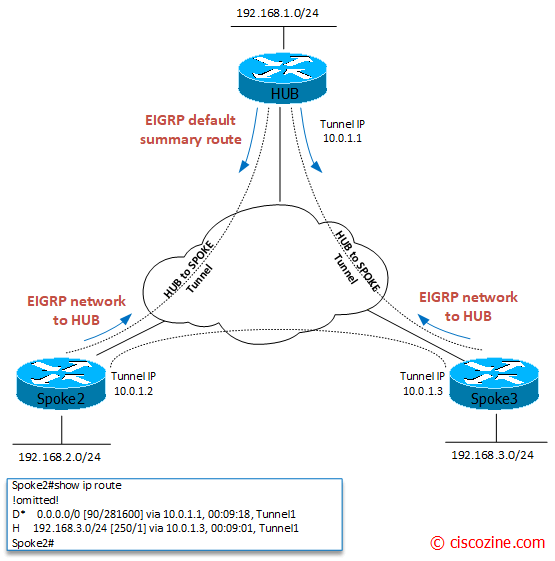 Routing Protocol: used to learn network between hub and spokes. NHRP: Allows spokes to be deployed with dynamically assigned public IP addresses (i.e., behind an ISP’s router). The hub maintains an NHRP database of the public interface addresses of the each spoke. Each spoke registers its real address when it boots; when it needs to build direct tunnels with other spokes (only on phase2 and phase3), it queries the NHRP database for real addresses of the destination spokes. Phase1: Provides hub-and-spoke tunnel deployment. This means GRE tunnels are only built between the hub and the spokes. Traffic destined to networks behind spokes is forced to first traverse the hub. Note: Because all spoke-to-spoke traffic in DMVPN Phase1 always traverses the hub, it is actually inefficient to even send the entire routing table from the hub to the spokes. Phase2: Allow spokes to build a spoke-to-spoke tunnel on demand with these restrictions: the spokes must receive specific routes for all remote spoke subnets. This causes Spoke2 to send a NHRP resolution request to HUB for Spoke-3 NBMA address. The request gets forwarded from HUB to Spoke3. Spoke3 replies directly to Spoke2 with its mapping information. Phase3: Allow spokes to build a spoke-to-spoke tunnel and overcomes the phase2 restriction using NHRP traffic indication messages from the hub to signal to the spokes that a better path exists to reach the target network. 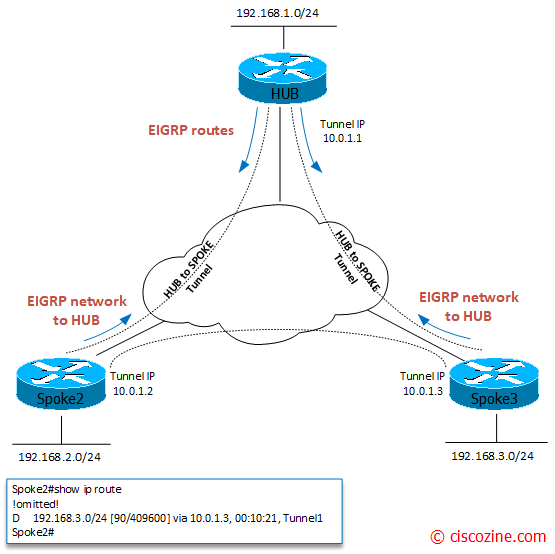 This functionality is enabled by configuring ip nhrp redirect on the hub and ip nhrp shortcut on the spokes. Then HUB “link” this traffic back onto the DMVPN network, triggering the NHRP process on HUB to generate the traffic indication to Spoke2 to resolve a better next hop for the remote network 192.168.3.0 (Spoke3). As you can notice, the network 192.168.3.0/24 is learned by the NHRP protocol with administrative distance 250. Cisco DMVPN uses a centralized architecture to provide easier implementation and management for deployments that require granular access controls for diverse user communities, including mobile workers, telecommuters, and extranet users.